if you keep to your course. Notice the featured image for this post. 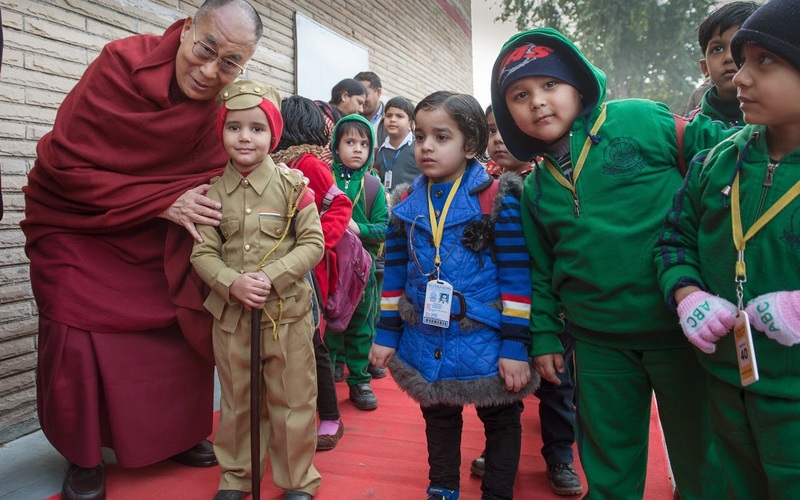 Indian elementary school children in line to spend a precious moment with his Holiness, Dalai Lama. Something of a visual contrast to this recent Presidential election. We know that suffering is all around us, the sacred and profane exist side by side at all times. How can we make a small difference every moment we have remaining in these human bodies of this incarnation? One small way is to savor the small conversations that sometimes fathom the deepest of depths and provide us simple wisdom/compassion and grace. I received this hexagram with Changing line 5: One who dabbles to what is good and correct. In your thoughts and actions, be gentle and accepting. Those who persevere on this path will meet with true joy and lasting success. With this changing line, this Hexagram changes to Propriety, Marrying Maiden. Confucius/Legge:Joy has the meaning of Pleased Satisfaction. We have the dynamic lines in the center and the magnetic lines on the outer edge of the two trigrams, indicating that in pleasure what is most advantageous is the maintenance of firm correctness. Through this there will be found an accordance with the will of heaven, and a correspondence with the feelings of men. When such pleasure goes before the people, and leads them on, they forget their toils; when it animates them in encountering difficulties, they forget the risk of death. How great is the power of this Pleased Satisfaction, stimulating in such a way the people! Legge: The feeling of pleasure is the subject of this hexagram, which is made up of the doubled trigram of Cheerfulness, or Pleased Satisfaction. The progress and attainment of the figure are due to the one magnetic line surmounting each trigram and supported by the two dynamic lines. The idea is that of mildness which is energized by a double portion of strength. 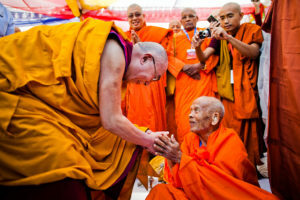 Anthony: This hexagram speaks, on the one hand, of that on which true joy depends, and on the other, of joy as desire, which leads to conflict. The essence of true joy is inner stability. Being firmly devoted to our path, we do not waver. When we think of the soft and comfortable path, on the other hand, self-conflict begins. Therefore, getting this hexagram indicates we may be wavering or irresolute.